Today, we will cover shoulder and sleeve adjustments. The sign of a tailored garment, to me, is all in the sleeve and shoulder. 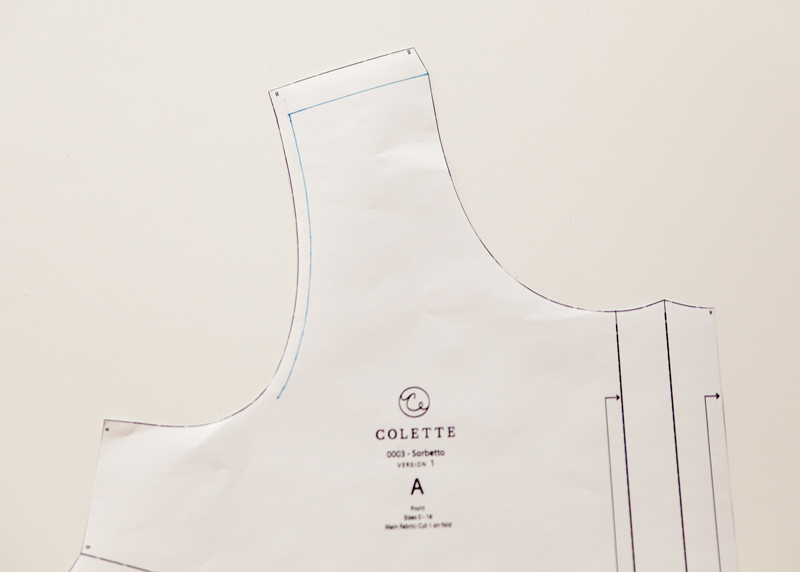 Getting this part just right completely elevates the look of a handmade garment. If your shoulders are wide, the bodice might feel tight across the back. In front, it pulls across the upper chest. The armhole seams appear to be pulling in toward each other with the strain from your shoulders. For narrow shoulders, the armholes sit too far out and off the shoulder. There is also excess fabric across the upper chest and upper back. 1) Mark the stitch line starting at the bottom of the armhole curve, up to the shoulder and over to the neckline. 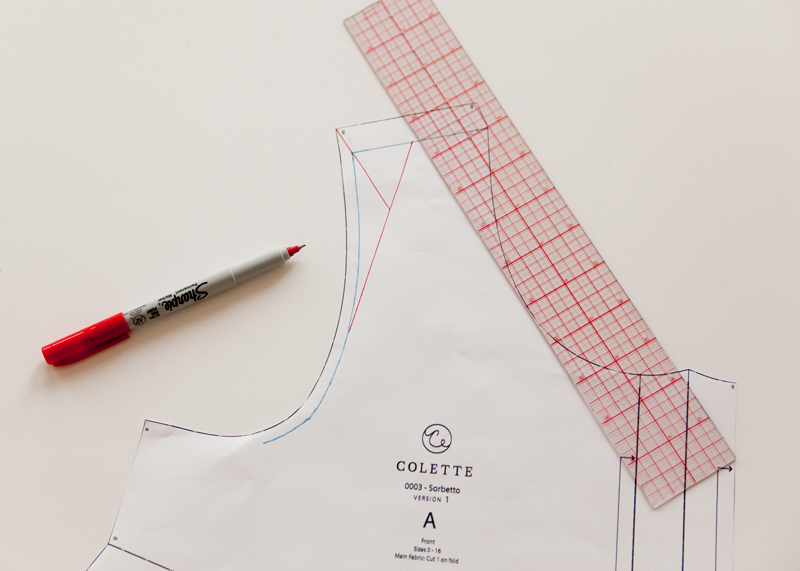 2) With a ruler, draw a line from the center of the shoulder to the armhole notch. We will refer to this as line A. 3) Draw a line through the outer corner of the shoulder stitch line to line A. This is line B. 4) Now it is time to get cutting! 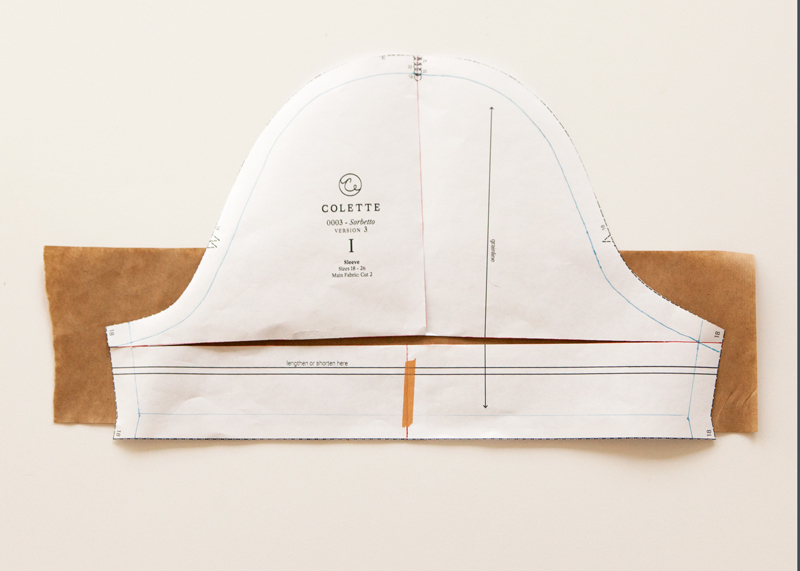 Start by cutting through line A, beginning at mid-shoulder and ending at the armscye stitch line. Snip through the seam allowance, leaving a small paper hinge. Then, cut through line B, beginning at line A, and stopping at the stitch line. Make a second snip through line B, starting at the corner. Stop at the stitch line, leaving a paper hinge. 5) You can now swing the shoulder in, to narrow the shoulder the desired amount. 5) Or swing the shoulder out, to widen the shoulder the desired amount. 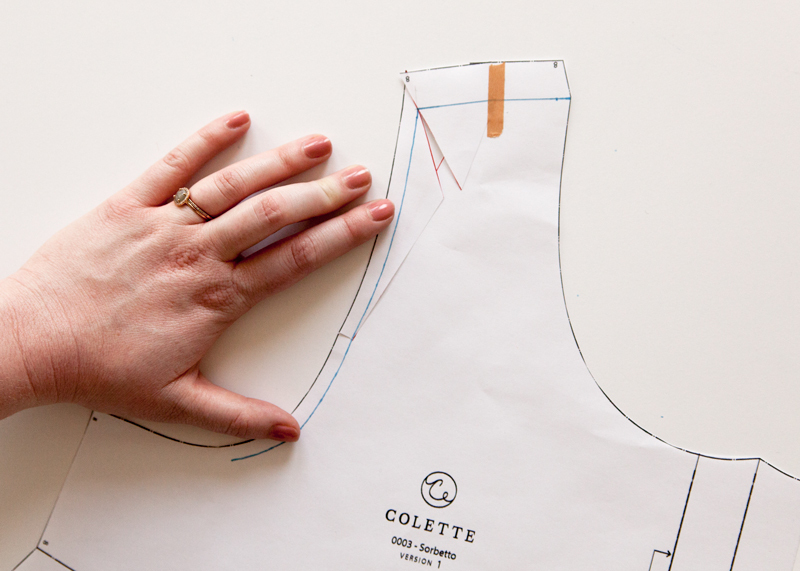 6) Repeat this process on the back bodice piece. 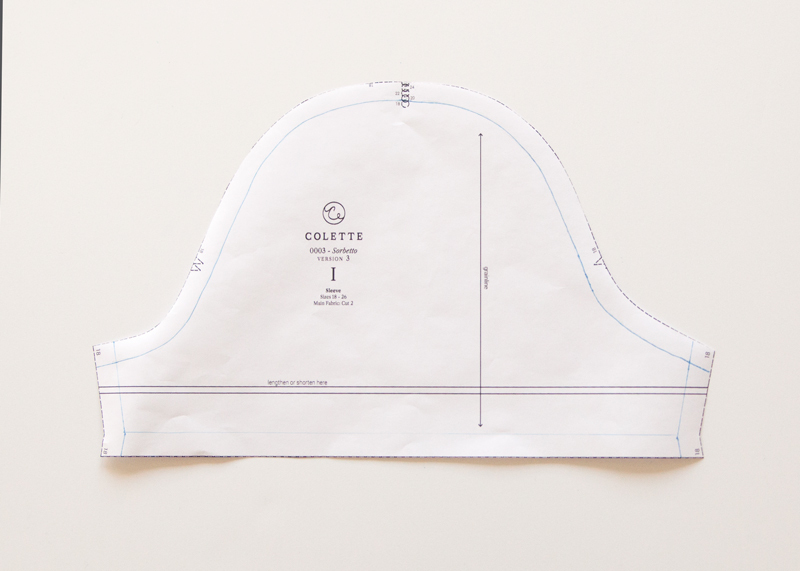 You do not need to make any armhole adjustments since you have only changed the width of the shoulder and the curve of the armscye, not the armscye length. This adjustment allows you to increase or decrease the width of the sleeve, specifically at the bicep. If your sleeve is too tight and uncomfortable or the fabric is straining across the sleeve, you will want to increase the bicep width. Conversely, if your sleeve is too loose and sits too far away from your arm, you will want to decrease the bicep width. 1) Start by drawing in all the stitch lines on the sleeve. 2) Using a ruler, draw a line from underarm intersection to underarm intersection, perpendicular to the grainline. This is line A. 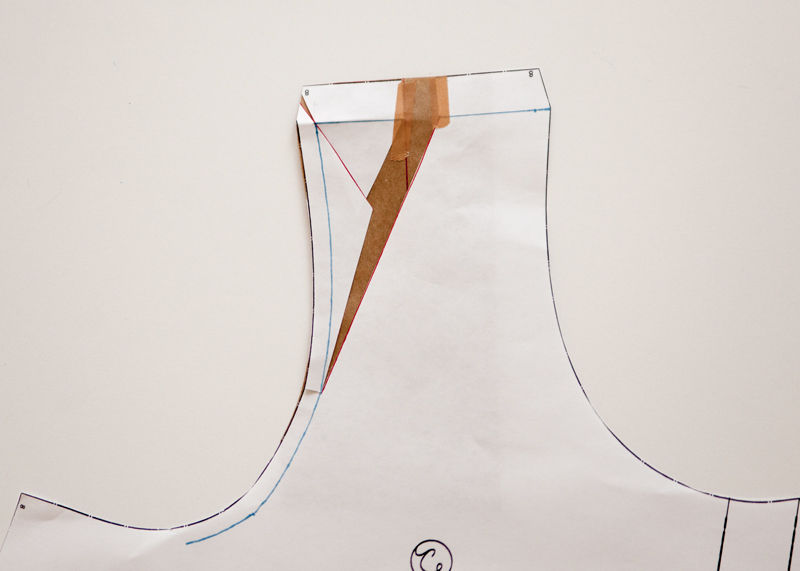 Draw a second line, perpendicular to the first, from the shoulder notch to the hem of the sleeve. This is line B. 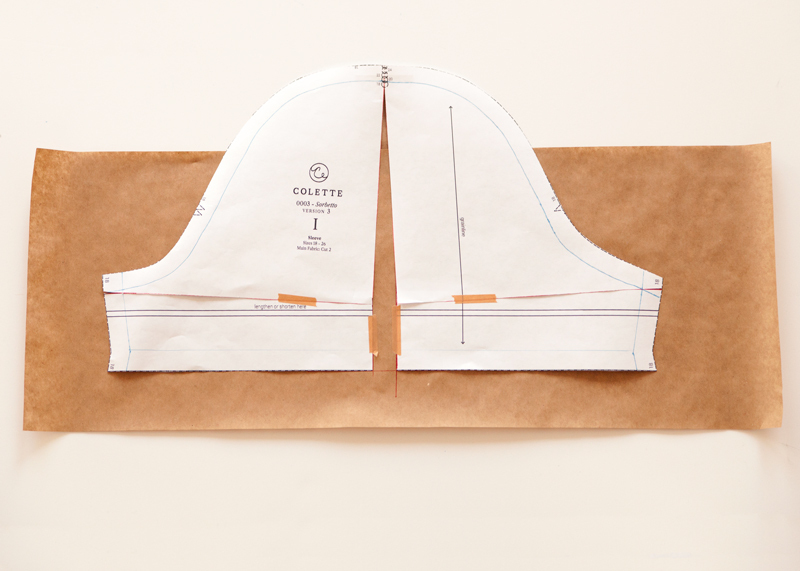 3) Starting at the sleeve hem, cut along line B. Stop at the sleeve cap stitch line, and “hop” over the stitch line to cut through the seam allowance, leaving a small paper hinge. 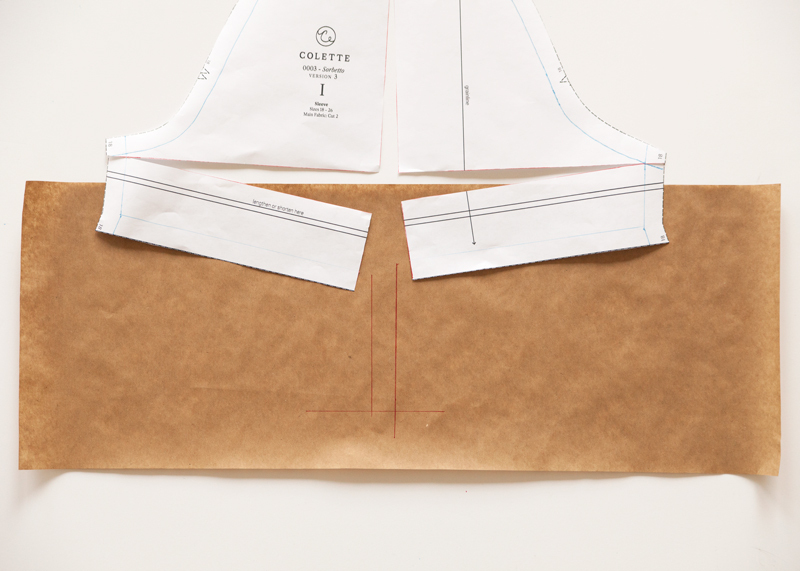 Starting at line B, cut through one side of line A, “hop” over the stitch line and cut through the seam allowance, leaving a small paper hinge. Cut through the other end of line A using the same method. 4) On a separate piece of paper, draw two parallel lines. The distance between these two lines should be the amount you would like to add to your sleeve width. 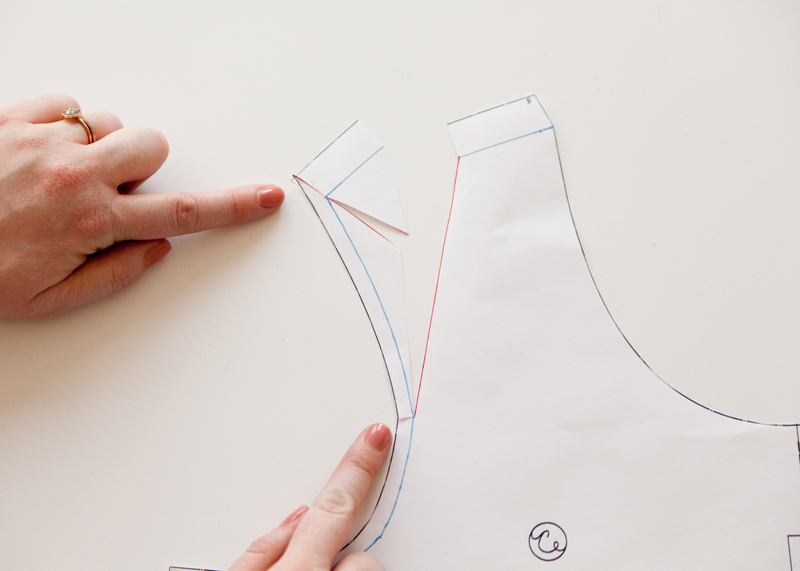 Draw a third perpendicular line to help you align the sleeve hem. 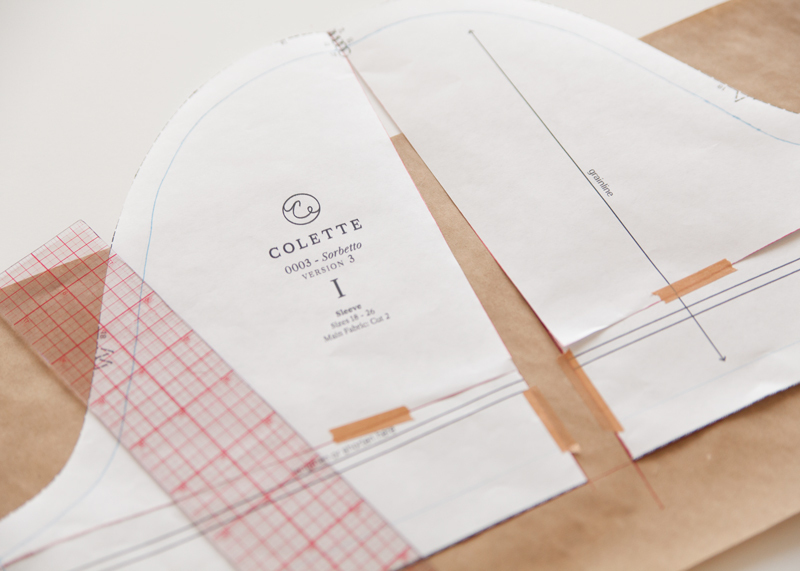 5) Tape the sleeve, aligning your guidelines with line B. 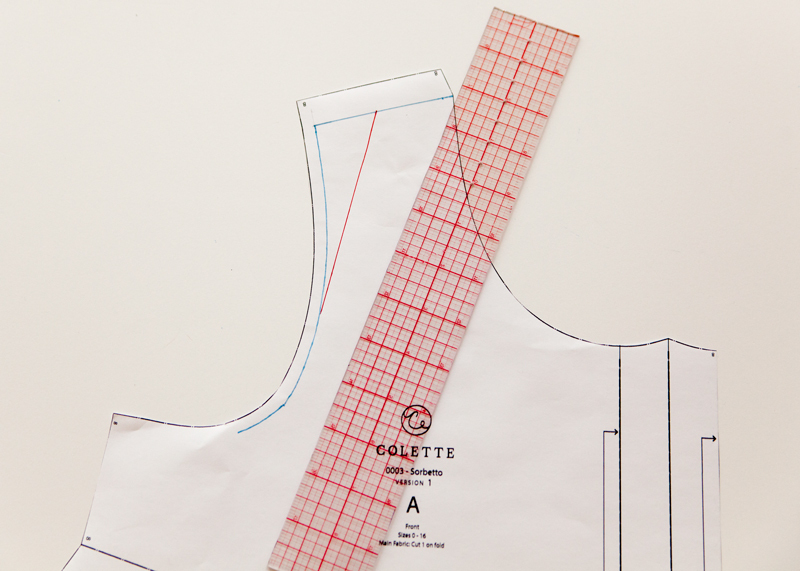 Make sure your sleeve hem aligns with the hem guideline. You will not need to make any adjustments to the armscye as this only changes the curve of the sleeve cap, not the length. 1) Repeat steps 1-3 from the previous section. 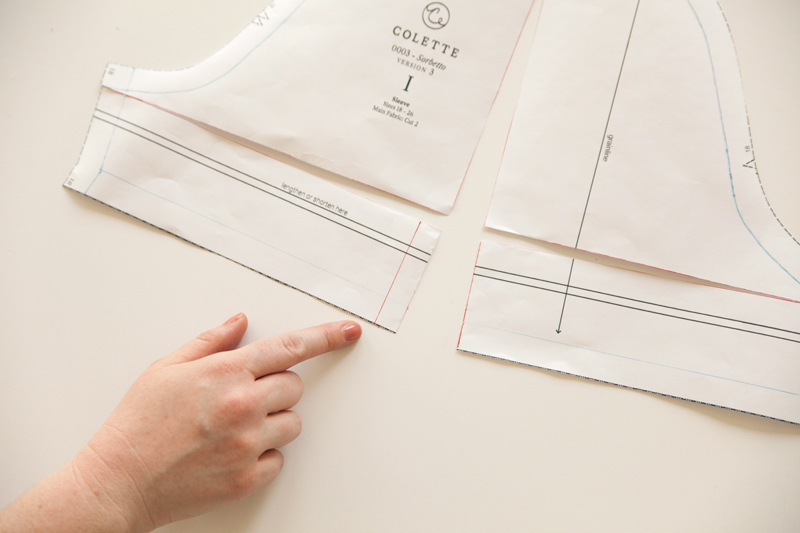 2) After slashing your sleeve, draw a guideline parallel to the lower portion of line B. This is your reduction line. 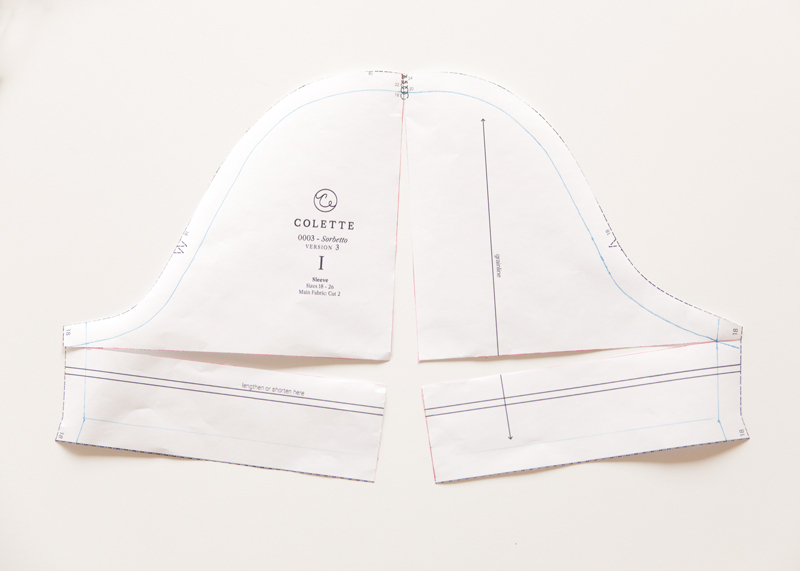 The distance between line B and your reduction line should be the amount you wish to reduce your sleeve width by. 3) Tape your sleeve so that the opposite side of line B aligns with the reduction line. On Friday we will tackle our final round of fit adjustments. We will cover full tummy adjustments and raising and lowering Sorbetto’s darts. Hi Bonnie, the seam allowance for the armhole on version 3 is 5/8″, this is because on this version you are attaching a sleeve. 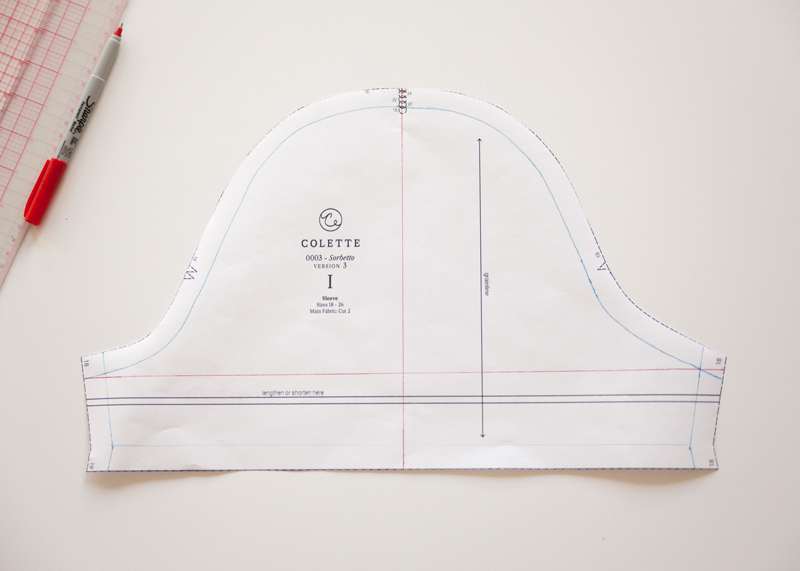 On versions 1 and 2 the armholes are finished with a 1/4″ double fold bias binding, which is why we stay stitched at 1/4″ when making our muslins. Staystitching in the case of this muslin serves two purposes, to keep the curved edge from stretching and also to give you a visual of the bias binding proportions. Hope this helps! These lessons are so incredibly helpful. Thank you! Here’s a problem I commonly run into: the armholes are too tight, even on tank tops. As in, they cut into the flesh in the front and back. Any ideas on how to address this issue? Is it a bust sizing thing? I’m not that muscular. Hi Bridget! What are your bust, upper bust, waist, and hip measurements? I can help you determine whether this issue that is being caused by the fit of the bust. What is the intended ease in the sleeve? If I need to adjust the shoulder (which I think I probably will), will I also need to adjust the sleeve? In which case, are the bodice of 1 and 3 the same? Because although I’ve put 3 together I might just do 1 as I don’t think I can redraft a sleeve. Hi Fiona, the shoulder adjustment addresses either wide or narrow shoulders, while the bicep adjustment addresses slim or full biceps. You may not necessarily need both. The bodice for versions one and three are not the same. So I can adjust the shoulder and the sleeves should still fit the pattern? Yes, this adjustment will not change the length of the armscye curve. Thank you for the sewalong! I’m trying to help my mom make a New Sorbetto version 3 for herself and we’ve gone through several muslins and have raised the dart. The biggest issue is a lot of vertically bunched up fabric at the back of the sleeve. Do you have any ideas what I can do to fix this?